Eltronicschool. - This is one of the ultrasonic range sensor for you in this time to show you one of the circuit schematic of HC-SR04 ultrasonic range sensor like shown in Figure 1 below. 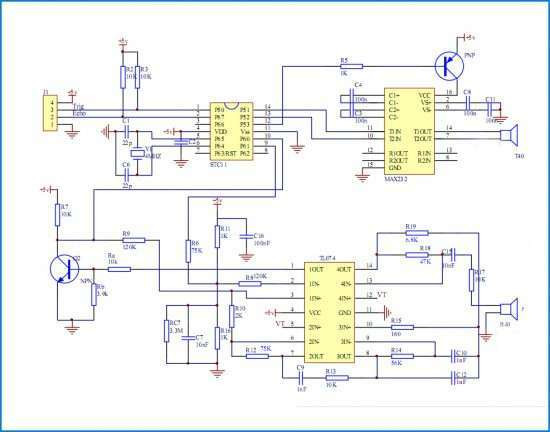 In this project with circuit schematic of HC-SR04 ultrasonic range sensor, you will show an how you can build the power inverter using special low cost in this time. According Electroschematics site describe thatthe HC-SR04 ultrasonic range sensor is a pretty cool pre-wired module that you actually enjoy using when you start playing with electronics, microcontrollers, and robotics. As you might have noticed, the most popular version of the module (comprised of an ultrasonic transmitter, ultrasonic receiver, and control electronics) has four interface pins — Vcc (5 V), Gnd (0 V), Trigger (Pulse In), and Echo (Pulse Out). The operating current of the module is about 15 mA at 5-V DC input, and its operating frequency is 40 KHz. The measuring range of the module is in the 2- to 400-cm range with a measuring angle of 15°. Thanks for sharing helful information. The Way of Your article presentation is very effective and very easy to understand. Keep it up.